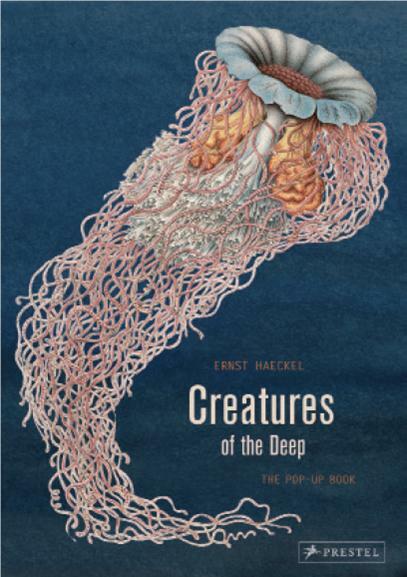 Creatures of the Deep : The Pop-Up Book, ISBN: 9783791372310 - available from Nationwide Book Distributors Ltd NZ. The book Art Forms in Nature is a collection of prints, made by the scientist Ernst Haeckel, of an enormous variety of flora and fauna from the sea—including microscopic Radiolaria, starfish, and jelly fish. Since Prestel published it in 1998, the book has been a favorite with artists, designers, illustrators, and anyone who enjoys the wondrous forms of the natural world. Now paper engineer Maike Biederstädt has transformed Haeckel’s transcendent work into a three-dimensional book that allows readers to appreciate Haeckel’s vivid colors, exceptional precision, and fascination with patterns and geometry. This stunning book features seven pop-ups that allow readers to see nature’s brilliance the way that Haeckel did—as marvelous, mathematically based creations that support his theory of the unity of all living things. Certain to appeal to his huge variety of fans, this pop-up version of a timeless classic will be treasured for years to come.